Alaska tops many a wildlife photographer's bucket list. From glacier-clad peaks to giant brown bears, you'll capture incredible images on our Ultimate Alaska Wildlife Photo Safari. Unlike standard big-ship cruises and bus tours, our exclusive wilderness adventure takes you deep into more remote parts of Alaska that stand in contrast to the most heavily touristed and commercialized areas that dominate most itineraries. We position you and your camera at the rail of a private yacht in front of calving glaciers, before a panorama of Denali from a backcountry wilderness lodge, and at river’s edge to capture a salmon leaping from the water into the gaping jaws of a brown bear. On our photo safari, you'll find an Alaska that's bigger, wilder and more amazing than you ever imagined! Denali Wilderness ImmersionSpend three nights at a backcountry lodge deep inside Denali National Park, close to North America's tallest mountain and far from crowds—a rare opportunity! With a maximum of just 12 travelers, there's plenty of space aboard our vehicles to stow extra camera gear and move about. Guests also have the full attention of our professional photographer Expedition Leader, always by your side to offer tips and instruction to help you get the best shots. This level of personalized experience is simply not attainable on a large bus tour or on board big cruise ships. Our Alaska wildlife photo itinerary has been designed in tandem with World Wildlife Fund to provide the very best wildlife viewing and photography opportunities. We've been running this trip for more than two decades, enhancing it every season, to create the most diverse and comprehensive Alaska wildlife adventure for our guests who love photography. Rather than spending the night at one of the masses of tourist hotels at the park entrance, we drive 90 miles into the remote interior of Denali to a secluded lodge that was grandfathered in when the park was expanded in 1971. This isolated experience embodies our philosophy of getting our guests into the wild and away from crowds. In Kenai Fjords National Park, we charter a private yacht, rather than booking our guests aboard larger sightseeing boats with a hundred other travelers—this affords a personalized experience with close-up views of glaciers, icebergs, whales, sea lions and myriad birdlife. A unique component of our adventure is an overnight on private Fox Island on the edge of Kenai Fjords National Park. At this secluded outpost accessible only by boat, we get a rare experience of authentic wilderness and all the peace and quiet that accompanies it. From our remote luxurious base at Alaska's Gold Creek Lodge, take a scenic floatplane flight to world-famous Brooks Falls in Katmai National Park in pursuit of close-up shots of huge Alaskan brown bears. Depending on the exact time of your visit (i.e., when the salmon are running), we may see them fishing for salmon in the falls—one of nature’s most iconic images, and a highlight of any Alaskan wildlife photography adventure. But at any time, numerous bears in the area make for thrilling shots, and there are fewer guests on the premises in late August and September. Natural Habitat has a well-earned reputation for hiring the finest naturalist guides on the planet. Our Alaska Photo Expedition Leaders average more than 15 years’ guiding experience and receive additional training from top WWF scientists. Our photo tour leaders are also outstanding professional photographers who are passionate about sharing their vast knowledge with our guests. See Photo Expedition Leader bios and traveler comments regarding the quality of our leaders. With Natural Habitat Adventures, you receive our exclusive guarantee, which clearly states that we will meet the lofty expectations set forth in our promotional materials. To our knowledge, this is the most ambitious guarantee made by any adventure travel company. Read our important promise. Because of our commitment to environmentally friendly travel, as well as the exceptional quality of our adventures. World Wildlife Fund—the world's leading environmental conservation organization—has named Natural Habitat as its worldwide travel partner, a designation that makes us exceedingly proud! Fill out the form below to receive additional information about our Ultimate Alaska Wildlife Photo Safari or give us a call at 800-543-8917. 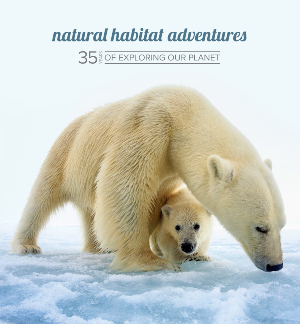 Hi Nat Hab, I’m interested in your Ultimate Alaska Wildlife Photo Safari. Can you please contact me with more information?